Snapp is a device that helps novices and amateurs create music. In response to the steep learning curve presented by overly complex music-making software, Snapp provides an intuitive interface that encourages users to begin creating immediately. 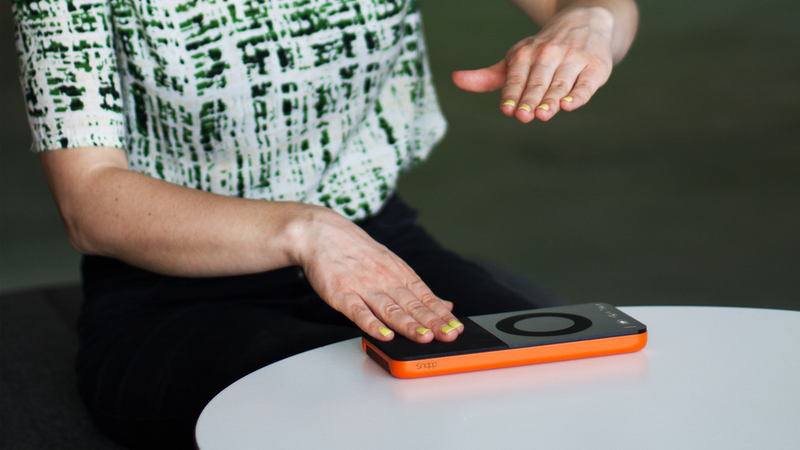 The device’s dedicated app helps users understand how their favorite songs are constructed while its touchpad encourages them to capture their own musical ideas as they happen. These ‘sound sketches’ provide an easy entry to composing music, extending the casual, unintimidating approach of drawing to sound. The result is a set of tactics for how to catch a sound inspiration and act on it with minimum distractions possible. It is manifested in a concept that focuses on what happens before and after the inspiration and let music makers to analyze, capture and ideate on their musical thoughts which allows non skillful users to explore musical self by letting them to sketch musical snippets. Digital music making tools are aiming for perfection and precision. This rationalize and complicate music making for serious hobbyists and make this user group shy away from music making and focus on mastering the digital tool. The interest in perfection and efficiency made digital tools to focus on the technology itself rather than the creativity. Snapp wants to challenge digital tool’s exclusive approach and attitude for perfection and precision which rationalize and complicate music making for serious hobbyists and make this user group shy away from music making and focus on mastering the digital tool. The interest in perfection and efficiency made digital tools to focus on the technology itself rather than the creativity. Simply Snapp aims to be "the Moleskine" of sound. Snapp is all about supporting the creators and capturing inspiration. What if we can capture our sound inspirations and sketch sounds? How can we overcome the distractions and focus on the ideas? Snapp lets people not only to identify and isolate sound inspirations but also act on them. Digital and physical tools are created around inspiration as a starting point and makes the natural ways of making music tangible by letting people to capture both their inspiration and ideas. The Snapp mobile app can dive into the deeper levels of songs and let’s people to zoom in and analyze different instruments and the scale that were used to create the song. It lets you trace the imprints the journey of making a song. 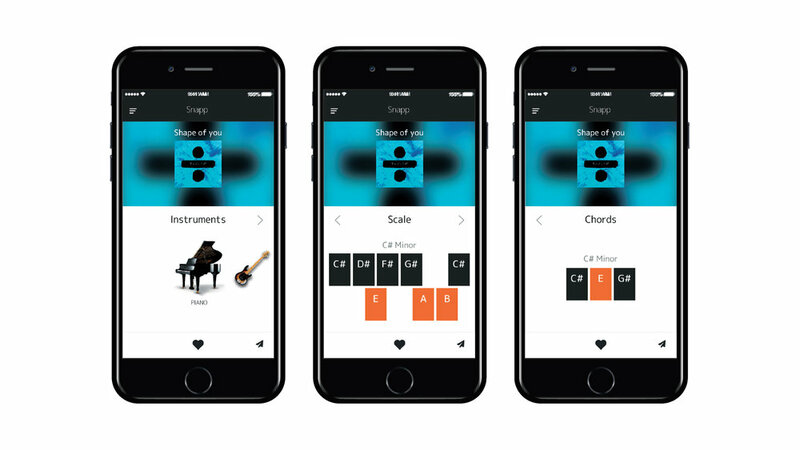 Moreover the app is what lets you pick a specific instrument of a song and save the instrument and the scale of the song for a jam session later. With the digital touchpoint, the concept not only aims to aid people to identify the source of the inspiration but also helps them to save the bits and core elements of it with the context. Keeping the context of the inspiration is aimed to work as an aid to audio memory, which once again is not as strong as visual memory. Therefore users can build instrument library and not losing the mental connection of the inspiration source with the origin: the song. This organized and contextual way of approaching the inspiration will hopefully accumulate and improve ways of capturing the sources of inspiration so that it becomes a necessary tool. Soundpad is a personal tool that allows you to explore instruments and melodies and also sketch your ideas. 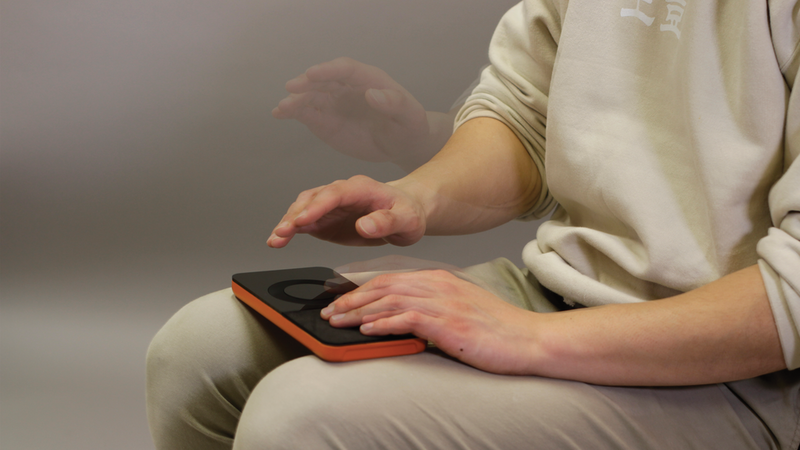 Soundpad works as a physical unit of rhythm, melody and tone which can be controlled individually. From within the app, saved instruments are synced with soundpad together with scales that the instruments were played as a content of the instrument. Therefore you always have an instrument and a scale to begin with which eliminates distraction and get you started with sketching your ideas immediately. This section of the product is a pressure sensor pad that allows user to tap the rhythm, a beat or trigger the melodies. This pad can be imagined as piano key but in this case it allows to control different notes and lets user to change the strength of the note (described as velocity commonly), vibrato. Meanwhile a piano key only let users to control one note at a time and with this layout I aim to bring more isolated control of melodies. This section of sketchpad is controlling the different notes of a chosen scale. Specific scale is already select within the app and transferred into sketchpad therefore users have defined frame to begin exploring melody scapes. 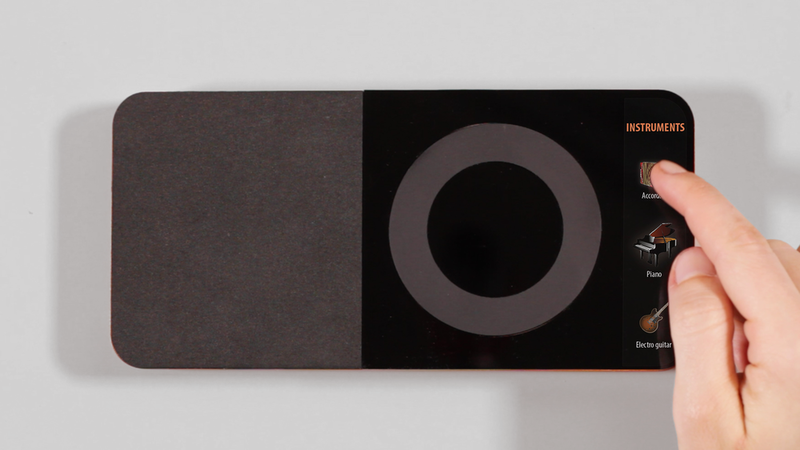 The ring allows users to change between different scales. By hovering above the circle users can change the note that is within the chosen scale. We perceive music not just by our ears but with our body skull and through space. Therefore moving on the z axis, aims to bring the 3rd dimension of sound and trigger different approach on music making. This section is a touchbar and mostly focused on different tones, in terms of different instruments that is already analyzed and selected within the app. Moreover this part has functions such as, record save and loop. This lets users to change tempo, jam with basic drum and bass, record musical snippets.